ElectroBraid is a permanent electric fence designed especially for horses. It is both a physical barrier and a psychological deterrent. It is highly visible to horses, strong, durable and resilient. Most important, it is so safe that the Company can offer a limited Safety Warranty against horses getting injured. ElectroBraid looks like high quality braided yachting rope. A double helix of copper wire conductors is braided into the outer jacket of the rope. 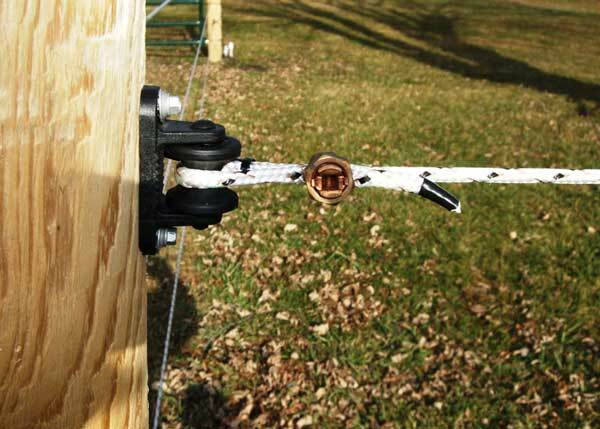 3 or 4 strands of Braid of ¼ inch diameter are mounted on electrical insulators on fence posts. 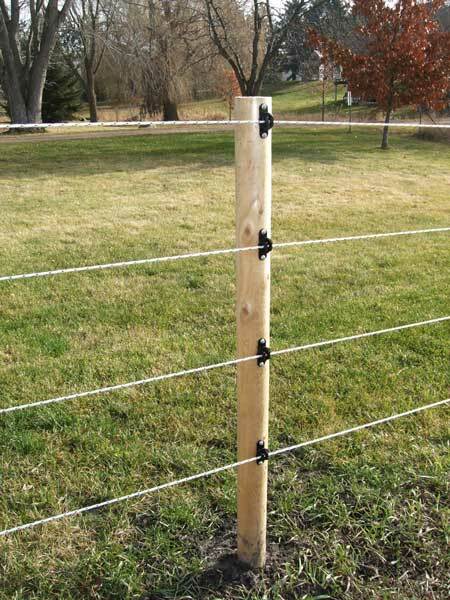 Fence posts can be wood, vinyl, steel or fiberglass, spaced 30 to 50 feet apart. The Braid comes in white, black or speckled. Why is it new and different? Traditional electric cattle fencing uses small diameter steel wires which are hard for horses to see. The ropes of ElectroBraid are highly visible. Their break strength is equal to the steel wire but they are resilient like the ropes in a boxing ring. ElectroBraid can absorb the energy of a panicked horse at full gallop and will typically bounce the horse back into its pasture with no harm to horse or fence. How durable is ElectroBraid Fence? The high-grade polyester fiber is the same fiber used in automotive seat belts and parachute harnesses. Polyester resists attack by ultra-violet light, salt, manure and most farm chemicals. The copper develops an oxidized outer layer or 'patina' that protects the copper wire from corrosion. The Braid carries a 25 year warranty. A quality energizer can last up to 10 years. ElectroBraid Fence is both a physical barrier and a psychological deterrent. Once a horse receives a painful shock the horse will not go near the fence again. It won't rub against the fence. It won't crib on it. And it won't try to jump over it or go through it or go under. It doesn't want to get shocked again. The electric shock from a UL or CSA approved fence energizer is completely harmless. The shock is extremely low amperage for 3/10,000 of a second, once a second. The shock is similar to the static shock you get from touching your TV screen, but more painful. Once shocked, neither you, nor your horse, want to touch the fence again. The brief electric shock causes a painful muscle contraction but there is not enough current to harm your physiology, heart or nervous system. The safety of a two year old child is the standard used by national testing laboratories such as UL and CSA. UL reports that there has never been a serious injury from a UL approved electric fence energizer since UL started safety testing in 1940. What makes ElectroBraid a safe horse fence? There are no impact injuries. There are no sharp points or hard edges. There are no boards to break or splinter. There are no wires to cut or puncture. Horses crib on board fences and rub against it. Even minor cuts can become seriously infected. The worst potential injury with ElectroBraid is if a horse is able to wrap a strand of Braid completely around a rear leg and struggles. The prospect of such an accident can be virtually eliminated by wiring and grounding the fence correctly, by keeping the Braid taut and by using an ElectroBraid Fence Minder. ElectroBraid has the same break strength as high tensile wire and, because it is so resilient, a horse can't break it. By contrast with conventional fencing that is not electric, ElectroBraid shocks a horse. The horse doesn't understand the shock - - it just wants to stay well clear in future. A horse has never voluntarily jumped ElectroBraid Fence, to our knowledge. How do horses feel about ElectroBraid? "Horses love ElectroBraid!" our customers tell us. Horses are herd animals, born to roam free in wide open spaces. With ElectroBraid fence, all the horses can see each other and stallions can see their mares. There are no places for predators to hide. Horses don't pace up and down their fence line. Owners say horses are more relaxed. They can see you and you can see them! ElectroBraid effectively excludes predators. Dogs and coyotes respect ElectroBraid, as do bears and cougars! Why is the installed cost low? ElectroBraid can be self-installed with hand-tools, by almost anyone….like stringing clothes line. A professional fence installer is not required. The Braid costs 16 to 18 cents a foot. Fence posts can be set 30 to 50 feet apart depending on terrain and local snow conditions. By contrast, conventional horse fences require a post every 8 or 10 feet. To relocate your ElectroBraid fence, you don't need a contractor. If you properly install your corner and end posts, they won't move. Brass and copper components won't corrode. Occasionally an insulator might break and need replacement. Little else will need repair. For some reason, lightning rarely touches ElectroBraid - - if it does, a few hundred feet of ElectroBraid may need replacement, and perhaps an energizer. If a tree falls on the fence, cut it off and the Braid will spring right back. Horses don't crib on ElectroBraid or rub against it. The fence is seldom if ever damaged by storms, including ice storms and tornadoes. Repairs are quick and easily done by hand. Walk the fence line to confirm your fence has not been damaged. Check the voltage regularly. An ElectroBraid Fence Minder will monitor your fence voltage 24/7 and warn you if the voltage drops. Once or twice a year, mow weeds from under your fence. In the spring, make sure no fence posts have been heaved by frost. How can ElectroBraid protect an existing fence? Mount ElectroBraid as a single strand on top of almost any fence. The psychological deterrence to horses is dramatic. One stallion that regularly jumped his pipe and cable fence, to impregnate a neighbor's mares, never jumped the fence again after a single strand of ElectroBraid was added. (Don't use cheap high tensile wire or polywire - - they are both unsafe to horses). How does ElectroBraid Fence compare to other electric fence systems? Stranded electric rope "unravels" under tension and needs constant tightening. By contrast, ElectroBraid is dimensionally stable because of its braided-over-inner-core construction. The Braid shrinks back to its original length, even after stretching. Woven electrical horse tape contains parallel electrical conductors. These wires take much of the strain and tension. The wires tend to break under windy conditions. By contrast the copper wire conductors in ElectroBraid are formed in helical coils like springs. This allows bend and stretch. All tension is taken by the fiber strands. The copper wires won't break up to 1,000 pounds tension and cannot break under normal loads. Conventional high tensile wire (HTW) electric fence is good for cattle but not for horses. Unlike cattle, horses are excitable, high-strung animals. Horses often don't see the steel fence wires. The wires can break under impact and wrap and cut and puncture flesh. 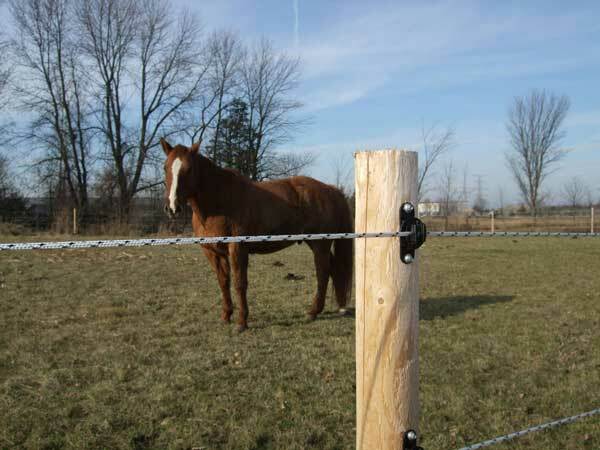 Certain electric fence rail systems are especially made for horses. These are worth considering but tend to be expensive to install and may not be as safe as ElectroBraid. Why does ElectroBraid specify accessories of copper, brass and glass-filled nylon? Quality…. Quality…. Quality…. It costs a little more but saves a fortune in performance and durability. Brass is an alloy of copper. Glass filled nylon is the strongest available commercial plastic material for insulator construction. Copper and brass are compatible metals. Brass is an alloy of copper. They don't suffer the natural electrolytic corrosion that occurs when dissimilar metals come in contact with each other. Copper does not rust. It develops an oxidized protective coating called a "patina". Next to gold and silver, copper is the best natural conductor of electricity. Copper is 70 times more conductive than steel. Telephone and power companies use only copper wiring. Choose the number of strands you wish to use. We recommend 4 strands. 4. Add these two numbers together ____ + ____=_____. This is the number of ElectroBraid Roller Insulators you will require. 7. Add these two numbers together ____+____=_____. This is the of ElectroBraid Line Post Insulators you will require. 8. Your choice of Line Post - wood, T-Bar, Fiberglass or steel - dictates your choice of Line Post Insulator. Count the number of Line posts and multiply by the number of strands =_____. This is the number of Line Post Insulators you will need. 9. Add the widths of all your gates together and multiply by the number of strands =____+ (6' x number of strands)=_____. 12. Add these numbers together = ____ + 20' for the distance between ground rods = _____. This is the length of Lead-Out wire you will need. Copper Split-Bolts are used to terminate a strand of Braid, to splice two strands together and for electrical connections. Select the proper Energizer from the chart. Every new ElectroBraid customer will want to purchase an Installation Kit. It contains the Installation Manual, a digital volt meter, (necessary for routine testing and troubleshooting), and one Tension Kit. 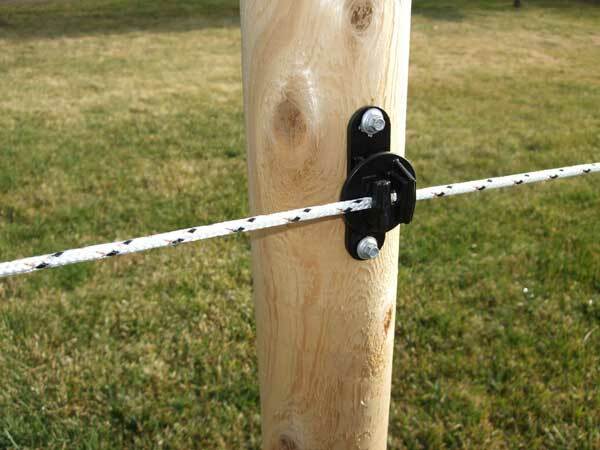 A second Tension Kit is helpful to secure proper tensioning when the fenced pasture is larger than one acre.